The summit hotel is the ALoft Downtown Hotel. SEGD has secured a limited number of rooms at a discounted rate. On the ALoft site please use the promo code "segd" to check if there are still discounted rooms available. Learn more about why you need to attend the SEGD Business Summit by watching our preview video below! 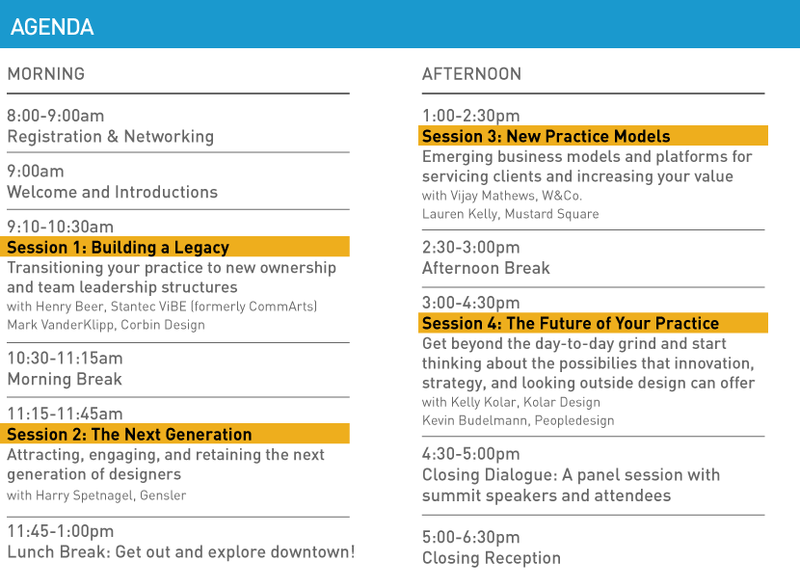 The summit will address a host of contemporaneous issues design firms and leadership are facing, and during the day, you'll have the opportunity to have your burning questions addressed. What new business models and product platforms should I be looking at? Should I consider selling my practice? Should I be looking beyond design for ways to grow my business? What role does design thinking play in the development of next generation practices? Do we buy a smaller firm to develop strategic capabilities or develop that talent in-house? What are the skills the next generation needs to have for us to remain competitive? What is technology going to do to the old service models we have relied on for years? Do we need to consider recruiting a new partner that has more technology and digital expertise? How can I grow my design business? How can I make sure my company continues and thrives after I leave? How can I recruit young designers to my company and keep them happy? A Board member recently asked me how, in just two years, we have been able to turn SEGD around after several years of decline to achieve all-time record improvements in practically everything we do. For sure it's an oversimplification to say, “It’s a generational thing.” But there ARE some key differences between Millennials and their older counterparts in the design world. 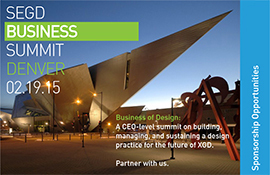 The Business of Design Summit will investigate this, among other topics. As Brand Design Director in Gensler’s Denver office, Harry Spetnagel is responsible for hiring the new talent in his group—so he understands the unique opportunities and challenges that Gen Y designers bring. At SEGD’s Business of Design Summit Feb.
Lauren Kelly and Vijay Mathews are both 30-ish entrepreneurs. Both are designers with a geeky side. Both have found ways to innovate design processes with new digital tools. And both are riding the tidal wave of technology impacting design practice today. 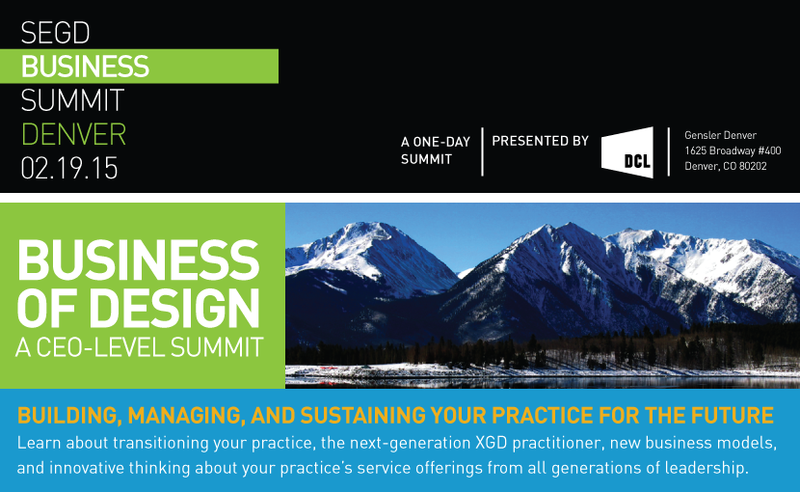 Join them at the SEGD Business of Design Summit Feb. 19 in Denver, where they'll be co-leading the session on Emerging Business Models & Platforms! Kelly Kolar has grown her company from a solopreneur design studio to an international, multi-million dollar company providing strategy as well as design service offerings. Always looking to the future and evolving her firm, Kelly will be a featured speaker at the SEGD Business of Design Summit February 19 in Denver. 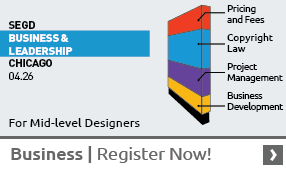 Join her and learn about raising your design offering to a strategic level! The Business of Design, says consultant and author Keith Granet, is about balancing creativity and profitability. I think we can all live with that as a simple definition.